TripSay (www.tripsay.com) is a new social travel service that allows users to create their own personalized destination guide. Taking tips and suggestions from TripSay's recommendation engine, users are matched with places, sights, content and activities from their friends or people with similar interests to create the ideal trip just for them. To get started, users input their vacation preferences and mark previous travels and visited destinations. TripSay then matches other users with similar preferences and helps to create personalised travel plans. Users can then read the tips, reviews and view photos of those suggested and add their own for others to view. The travel category is well matched to the principles of social media and social networking. 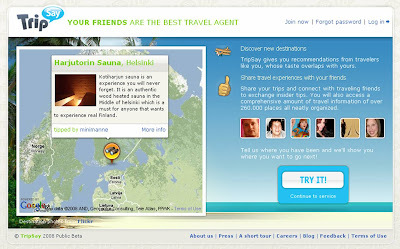 Travel sites that connect likeminded individuals (either personally or through reviews) are flourishing. Where WAYN lead the way, a new generation of travel sites are appearing. Schmap offer interactive guidebooks (for both PC and iPhone), Dopplr targets business travellers and the new travel social networks like TripWolf, Metrotwin and TripSay aim to empower travellers by helping to create personalised travel plans - why use a generic guidebook if you can find up to date recommendations from people who share your interests?! I'm sure there will be more developments in social media travel - interesting to see what comes next!